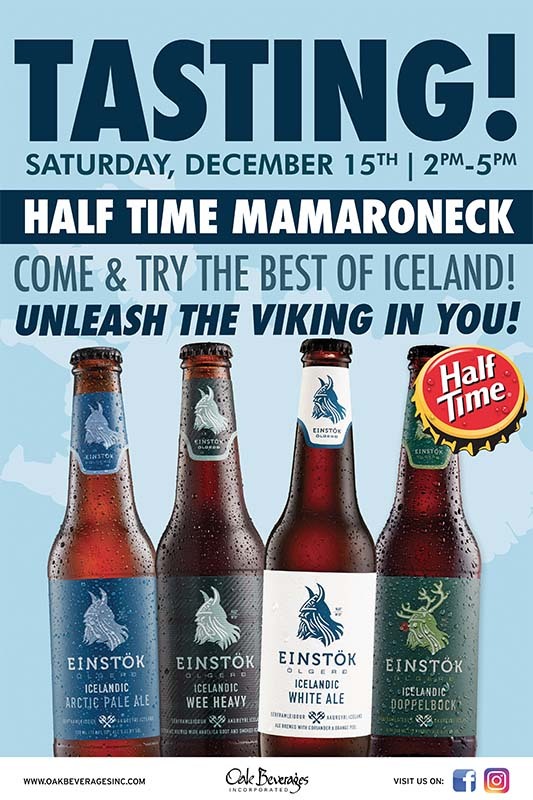 Einstok Tasting Event at Half Time Mamaroneck - Oak Beverages Inc.
Einstok Tasting Event at Half Time Mamaroneck, Saturday, December 15th, 2pm – 5pm. HALF TIME has been supplying craft beer and cider enthusiasts with perhaps the most elaborate selection of beer and cider in the world for over a decade. HALF TIME employs some of the most knowledgeable beer/cider geeks and are always excited to walk you through the latest collaborations, limited releases and seasonal beers/ciders as well as our broad year round selection. We enjoy helping our guests select the perfect beers and ciders for any occasion; be it a party, beer or cider tasting, food pairing, gift, or any other situation that calls for a beer or cider. From Abt 12 to Zywiec or Angry Orchard to Naked Flock, no other beer/cider-only-store in the world offers the selection of beer and cider in a bottle and fresh beers On Tap you can take home in a Growler. We also offer some of the most widely acclaimed Beer of the Month clubs; six different Beer Clubs each designed to satisfy a wide variety of tastes and pocket books. You’ll also discover a remarkably diverse selection of beer gifts and gift baskets including Cider Gift Baskets; perfect for any beer or cider enthusiast. With over 2,000 beer and cider varieties in the store, you can look forward to uncovering new beers and ciders every visit while rediscovering old favorites and long forgotten brews. Whether you’re purchasing by the case or by the bottle, Half Time offers the widest selection of beer and cider; sure to please and amaze everyone from beer enthusiast to cider snobs. Boasting a perfect rating on Beeradvocate.com and Ratebeer.com, Half Time has both the selection to keep you captivated for hours and the customer service to help you find exactly what you need in minutes. Whether you’re visiting the store or ordering online, we look forward to providing you with the best beer and cider the world has to offer all under one roof.